Book a private party with us! What a great idea! Birthday parties! Office parties! Holiday parties! Bachelorette parties! 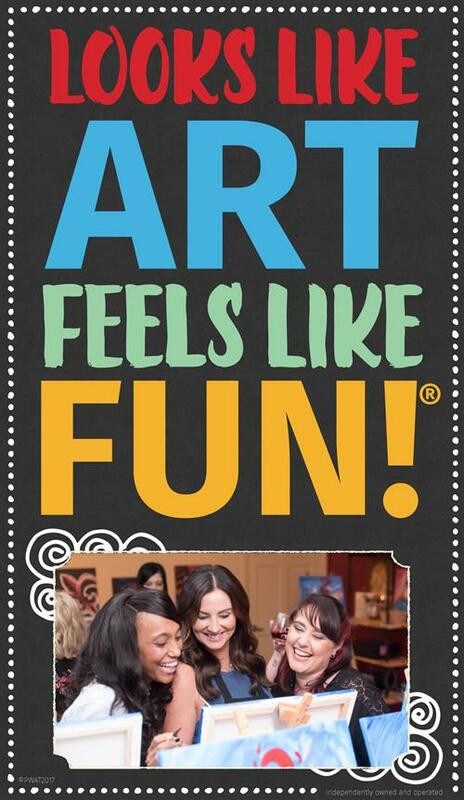 Why book a party at Painting With A Twist? 1) It's a fun, different idea. What a great way to spend time with a group of people -- your co-workers, your friends, your family. And everybody leaves with their own original art. How great is that? 2) You'll get your own private studio and your own private instructor. No extra charge. 3) You can pick your painting. You pick your time and day. We'll send you an e-mail link to our entire gallery. We've got more than 5000 pieces to choose from, in a wide variety of categories, including (but certainly not limited to) Florida art, seasonal art, children's art, landscapes and abstracts. We even have more than 100 couples paintings. Each person paints half of the picture on their own 16 x 20 canvas, and the two pictures are combined to create one great work of art. The price is $35 per person for a two-hour class (or $40 for Wood Pallet or Extra Long 10x30 Canvas), $45 per person for a three-hour class, or $25 for a 1.5 hour kids class (ages 7-12). And of course, you're welcome to bring as much food and beverage as you want. We'll provide cups and bottle openers. A valid credit or debit card number is required to book your party. Your card number will be held until the date of your party and not charged unless you do not have the minimum number of painters required. In that event, we will charge your credit card the amount necessary to make up for the shortage of painters. A $100 cancellation fee will be charged if the party is canceled less than 7 days before its scheduled date. 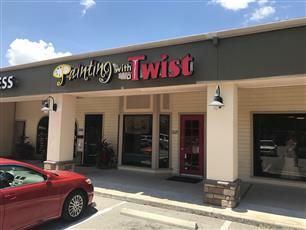 Call us at 863-646-0238 or send us an e-mail at studio047@paintingwithatwist.com. OR PLAN A PUBLIC PARTY! 5 or more guests and want to CHOOSE the painting for a public event on a weeknight? Contact us to plan a Public Party! YOU PICK the artwork, others join the FUN! Contact us for More Info! BYOB- Must be 21 years or older to consume alcohol in studio. Wine or beer only, please!